Deepikka Jindal is the Chairperson of O.P. Jindal Modern School and Vidya Devi Jindal School. However, leadership in education is only one part of her life. Deepikka is the Managing Director of JSL Lifestyle Limited and the Chairperson of O.P. Jindal Cancer Hospital and N.C. Jindal Institute of Medical Care & Research, a 250-bed Multi Specialty Hospital. A great humanitarian, Deepikka also decorates the leadership of the Jindal Stainless Foundation, a CSR wing of Jindal Stainless Limited. Following her passion to promote stainless steel in all its forms, she founded 'The Stainless' an art gallery, where she patronizes artists to create beautiful pieces of art in this material, giving them all infrastructural and financial support. A multifaceted leader and a great artist, Deepikka is an inspiration to many. Kolkata, the city of joy, has a special bonding with its Loreto House School. They know that every Loreto girl would strive to stand out from the crowd.Indeed, that is what this 176-year-old institution teaches - to celebrate the uniqueness of every individual.As an alumna of Loreto House School, Deepikka Jindal was also taught to be responsible for her own future and to script her own life story. She would do it eventually, but not as quickly as many other successful Loretians. "Learn what is new and leave what is not working"
Born in a conservative Marwari family based in Kolkata, higher education was not a preferred choice for Deepikka, whose childhood dream was to be an academician. At a young age of 19, she was married to Ratan Jindal, a scion of one of the wealthiest families in India. For Deepikka, it was not a mere marriage, but an entry into a fascinating world of opportunities that Jindal family would offer her later. "Vidya Devi Jindal School in Hisar was instituted at the same year when I got married to Ratan Jindal. Later on, the leadership role of the school was passed on to me as a legacy from my husband's family. I am just a caretaker of this institution," Deepikka recalls about the first major task given by her father-in-law, OP Jindal and mother-in-law, Savitri Jindal. When Deepikka became the Chairperson of Vidya Devi Jindal School, she was in her mid 30s with two kids who were independent enough to take care of themselves. Deepikka had the time to do something professionally. However, was she ready to carry such a big responsibly on her first job? 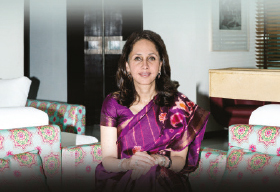 "I wasn't sure about the outcomes when I was asked to take over the administration of Vidya Devi Jindal School. But, I wasn't scared too," says Deepikka. Handholding Deepikka to the realm of leaders was her life partner, Ratan Jindal - the steel tycoon who was instrumental in transforming Jindal Stainless from a producer of basic stainless steel products to over USD 3 billion provider of stainless steel solutions. He has always been Deepikka's biggest supporter and her source of inspiration. Today, Deepikka is one among the few philanthropists in the country who recognize the tremendous importance of education, not only for their own success, but also for future generations.She says, "What I enjoy most is that I am a part of India's education establishment and I am being able to provide these young kids an institution, which will make them great citizens and human beings in the world." Under the leadership of Deepikka, Jindal family runs two schools in Hisar - O.P. Jindal Modern School (OPJMS) and Vidya Devi Jindal School (VDJS). While, VDJS is a premier residential school for girls, OPJMSis a Senior Secondary, Co-educational, English Medium Day School with a whopping strength of about 5000 students. Deepikka claims, "VDJS was one of the first schools to provide quality education and all round development of girls in a safe environment, while striving to give the best to the children in every way possible. Seeing these girls learn, grow and leave the school to become great contributors to our country gives immense satisfaction as an administrator." Approximately 150 KM away from New Delhi, VDJS campus has an academic wing, a utility block, a large auditorium, a health club, an infirmary, a dining hall with a seating capacity of 1000, an outdoor swimming pool, a roller skating rink and four hostels to accommodate 800 students. Including 134 faculty members, the school has over 400 staffs and an impressive student to faculty ratio of 1:8. On the other side, OPJMS has sprawling campus that spreads over an area of 20 acres of land. The school offers Medical, Non-Medical, Commerce and Humanities Streams for students of classes XI and XII. However, Deepikka does not stay in Hisar to look after the day-to-day activities of the schools. Living in Delhi, she would visit the schools more than twice in a month. "The schools are professionally run. I don't need to be physically present there to ensure its smooth functioning," claims Deepikka. In fact, Deepikka as an administrator trust people who work with her and that is what makes her different from many leaders in our country. Deepikka is far from being a dictator and she has an aura of power more fitting to a creative businesswoman. That is indeed her other part, or her major focus - an artist with a passion for steel. It is true that there would be a little bit of steel in everybody's life. But, if you are a member of Jindal family, then steel is your life. Deepikka is not different. She is in love with the steel, but in a creative manner. Arttd'inox, the lifestyle stainless steel products brand of the O.P. Jindal Group, is the brainchild of Deepikka. At Arttd'inox, Deepikka satisfies her creative instincts and explores latent possibilities of shaping the metal into a work of art. "Arttd'inox is the only producer of stainless steel lifestyle kitchen products in the country. As a businesswoman, this is what I do and I enjoy every bit of it," says Deepikka. Thanks to the creative outlook of Deepikka. Since the arrival of Arttd'inox in the market, stainless steel merchandises have achieved an artistic licence and cemented its spot among the luxurious lifestyle products. Today, working with leading designers around the globe, the brand is actively engaged in bringing innovative design concepts in tableware, home d'cor and kitchen concepts. Under Deepikka's visionary leadership, Arttd'inox has also won many highly acclaimed awards such as EDIDA, India Design Mark, Red Dot (honorary award). Amidst of all these buzzing businesses and philanthropic efforts, however, Deepikka manages herself to remain calm and composed. She finds enough time to spend with her family, attends social gatherings, reads books that she loves and participates in spiritual courses for her own self-improvement. "Spiritual growth is very essential in life along with all the career achievements. I do not want to lose that part by overdoing other things," pinpoints Deepikka. Now in her early 50s, Deepikka is not contemplating about a retired life. She is as strong as steel. "Like the leadership of the school came to me, I would be giving it to my daughter-in-law. The family tradition will continue in that way. However, I am not sure about the future leadership of Arttd'inox. I will work for it as much as possible," assures Deepikka, who has taken the road less travelled by and has miles to go, to remain as an inspiration to a whole new generation of women leaders.